Mojave and AppleScript Applets - Announcements - Late Night Software Ltd.
One thingto keep in mind: if developer certificates were free, Joe Blackhat and friends would download them by the thousand and Gatekeeper would essentially be rendered useless. That said, you shouldn’t be getting asked for permission each launch. That sounds like your code is being altered each time. Try making the .scpt file(s) in your app execute-only (use chmod and a-w or similar). Shane, what I’m seeing is that once saved, I can run applets on Mojave and I’m only asked for permission to run once. However, each time I save the applet, I’m prompted once more for permission to run the applet. I get prompted each time I run it. If I comment out the set line, I only get prompted after the save. This suggests to me that @Garry’s problem is that his script is modifying global values each time it is run. Ahh, in my tests I wasn’t altering and properties or global variables. Makes perfect sense now that you’ve pointed it out. One thing to keep in mind: if developer certificates were free, Joe Blackhat and friends would download them by the thousand and Gatekeeper would essentially be rendered useless. Thank you, yes, I can see that although maybe blackhats are dissuaded by the process more than the fee. I’ve hoped there could be some other arrangement perhaps with extra rules for hobbyists but Apple seem to be pushing hobbyists out of the field. I don’t understand the significance of the comment about global variables. I do have global variables which store values used in my script and which change – eg. path name to a folder which the user can change. Because they are not constants and need to be available to a number of handlers, I’m declaring them as global variables eg. at the beginning of the script and setting the values when needed eg. 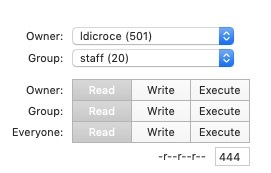 But, I can confirm that although System Preferences show my applet has permission to control Finder and System Events, I have to give permission again each time the script is run. Would it make any difference if I declared those global variables as local then, passed them to and from each handler ? Also, my applet is not run only. Is that relevant ? P.S. How do you get colour into these posts ? I don’t understand the significance of the comment about global variables. When a script is run, if that results in changes to the value of any top-level variables, the script is normally saved back to disk with the new values. (This is how property persistence works.) That means the security system sees the app has changed, and thus needs renewed permission. One relatively simple way to stop this is to change the permissions of the applet’s embedded main.scpt file. Would it make any difference if I declared those global variables as local then, passed them to and from each handler ? Yes. But you also need to make sure there are no top-level variables changing. Also, my applet is not run only. Is that relevant ? How do you get colour into these posts ? Wrap any code in lines consisting of three back-tick characters. Global variables are saved to disk! Shane, thank you for all that. I’ve vented some rant in another post. For new version of the applet – Mojave pops the permission request(s) on applet start-up. For each further applet start-up in the same session – Mojave pops the permission request(s). For each further applet start-up in later sessions – Mojave does not pop the permission request(s). I think I can live with giving new permissions when installing a new version of my applet. Which is the new setting for the permission to avoid this? The whole thing of logging off and on again to suppress the dialogs is odd to me – if there is a concern about security in this situation, why let a logoff-logon suppress the dialogs ? That might be a bug and so Apple may well change that behaviour in a future release of 10.14. The whole thing of logging off and on again to suppress the dialogs is odd to me – if there is a concern about security in this situation, why let a logoff-logon suppress the dialogs ? By default, the scripts in applets are saved with -rw-r--r-- permissions. Could it be that you’re logging in the second time as other than the original file’s owner? Thanks for the droplet. It is a good option to speedup the process. On Mohave, can I have a standard AS applet that is code signed and saved as run only which contains a helper applet that is also code signed and saved as run only? I have just tried making my helper applet run only and now the main applet on launch warns me that the file might be damaged etc and then quits. I thought I might have read something about this somewhere but maybe it was to do with library scripts rather than helper apps. I thought having the helper apps saved as run only might be a good thing for security but seems the system doesn’t like it. And incidentally should I be choosing to make script libraries run only? Or perhaps what I’m really trying to ask is: can I make the script libraries run only? can I have a standard AS applet that is code signed and saved as run only which contains a helper applet that is also code signed and saved as run only? Yes, as long as they’re signed with the same certificate. can I make the script libraries run only? Just to be clear, is there no alternative to code signing your applet to have it run on Mojave? Another question. I have an AppleScript app that does impositions in InDesign. It is running fine on the one Mac we have currently running Mojave. However an AppleScript droplet that sends emails gives the error that the application could not be opened. Why does one work and the other doesn’t? is there no alternative to code signing your applet to have it run on Mojave? There is no requirement to codesign except if you want to pass muster with Gatekeeper. Please read the article pointed to in the first post of this thread. Very helpful article. Thank you Shane. However, I’m still having an issue with a droplet. We added the app to the Full Disk Access tab in the Security & Privacy System Preference. If I comment out the On Open and End Open lines and use a Choose File command instead, the script runs fine on the Mojave machine but trying to use it as a droplet with an On Open command gives a “The application could not be opened” error. Do you know why this is happening? What type of file are you dragging-and-dropping?